Clothing with polka dots, whether ordinary summer dress, evening dress or blouse are always full of charm. Artlessly simple pattern seemed fraught with a slight grin, mischievous touch, the supernatant of cute children of lovely childhood . Basis «pea» patterns are circles of different sizes would seem to be easy. But like all the polka dots — and it is truly amazing. 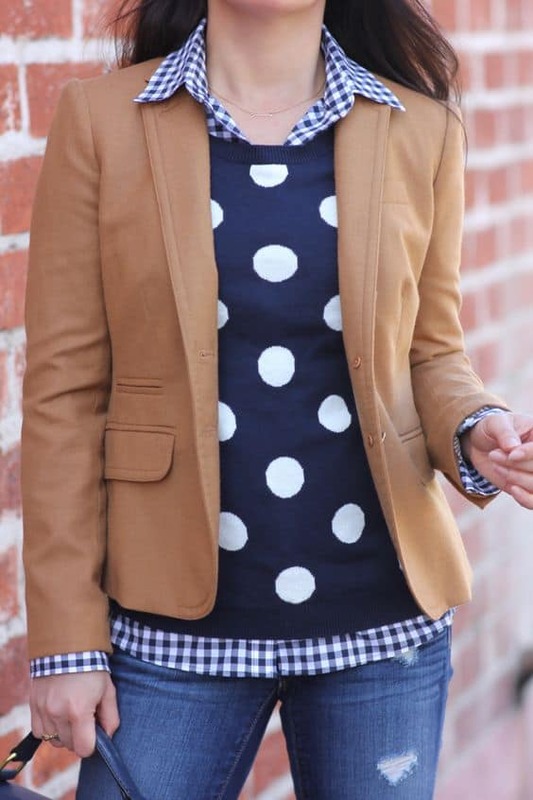 For several years, designers offer women clothes with polka dots. This figure is so popular is that, regardless of fashion trends present in outfits and accessories women of any age. About a fan of color psychologists say that they prefer to have the freedom and self-irony. And the larger the polka dot, the more sociable woman. It is believed that the fabric with a pattern that could be called polka dots only conditionally, have found their place in the European only in the eighteenth century. This picture has found its place at the court of Napoleon. Fashionistas decorated their light dresses with high waist loose dots of different sizes. In England, only in the nineteenth century began to produce fabric with dots, which, however, immediately liked the local ladies. Not only them. Due to the known dandy Beau Brummell men got scarves in round spots. In the fifties and sixties thanks to Christian Dior and Yves Saint Laurent polka dots entrenched on the podium , appearing in a variety of ways. It was not only the dresses, blouses, jackets, and accessories — belts, scarves, bags, hair clips. 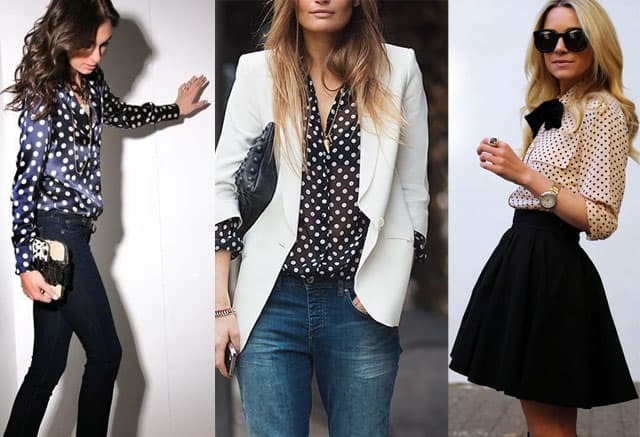 Designers are constantly changing the size of polka dots, a combination of shades of the main figure and the background. Polka dots can be large and small, can resemble a point to be randomly arranged and orderly. 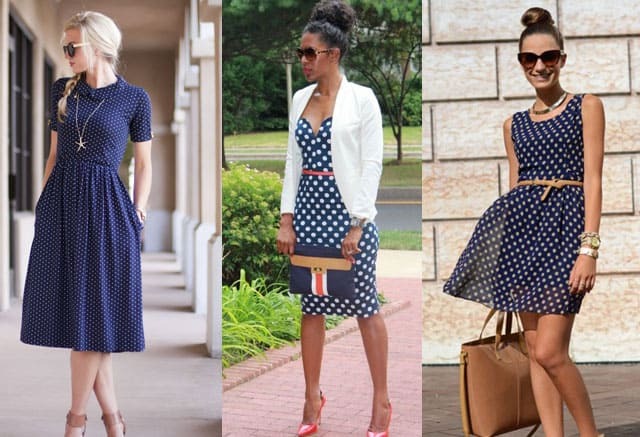 The dress with polka dots can make a woman elegant or fun, frivolous or restrained, strict or relaxed. It can be used to create a retro outfits. 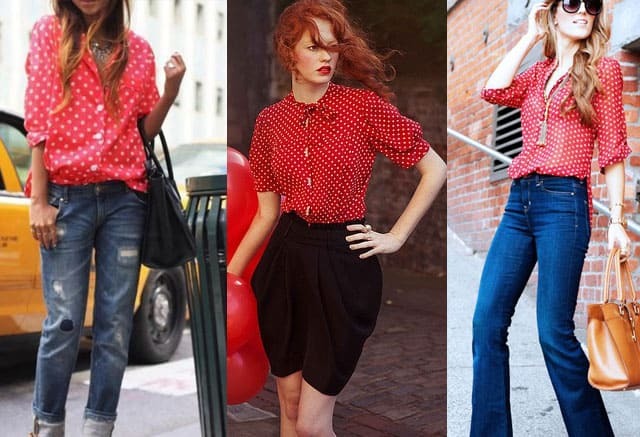 For example, dresses and blouses with low waist and a few large polka dots remind of the era of the twenties. Layered skirt — the style of the fifties. Dresses in the form of trapezoids knee-length will take in the sixties, as a model for cocktail -style new look — in the seventies. With this pattern, you can create any image to change not only the look but also the mood. Dress fabric to medium-sized, often located polka dots, resembling an hourglass, allow a woman to look romantic and attractive. Suit with a narrow pencil skirt made ​​of light material in small bright polka dots on a dark background suitable for the office, as looks quite severely. A short sleeveless dress with tulip skirt, decorated with bright polka dots print, perfect for young girls wardrobe, this outfit can be worn for a walk, a disco, a party with friends. Polka dots well with ruffles, lace and help create an image of a romantic, dreamy person. And if lush multi-layered skirt or dress to add a wide belt with a bow, you can create an image of a naive girl. Traditionally considered a combination of white polka dots on a black background. Designers say that with the help of a color can hide some of the features of shape, for example, visually reduce the wide hips and protruding belly, improve your posture (this applies only to small polka dots). Interestingly, black dress with white polka dots to say about women romantic mood and white dress in black polka dots about a light character and desire to have fun at every opportunity. Dresses in black and white polka dots should be combined with bright monochromatic accessories: belts, hats, bags. Combine the classic polka dot suit can also be in a neutral-colored jacket, shoes and other items of clothing. 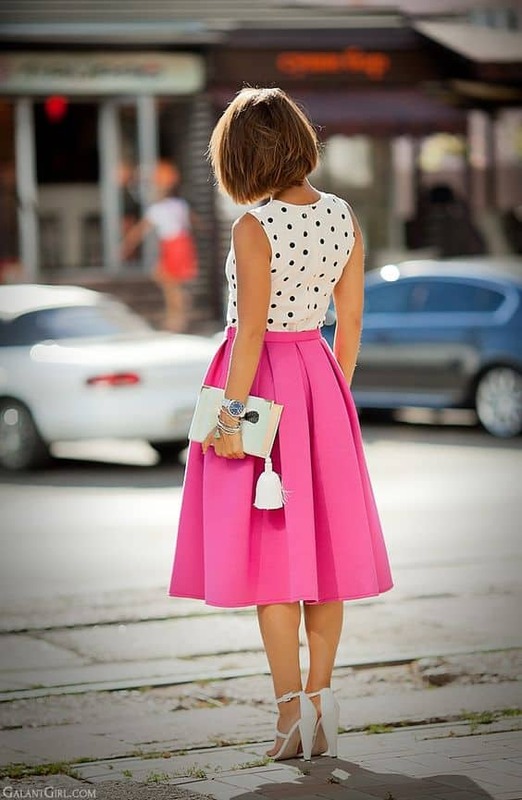 Trendy and very stylish are looking peplum outfits with polka dot. 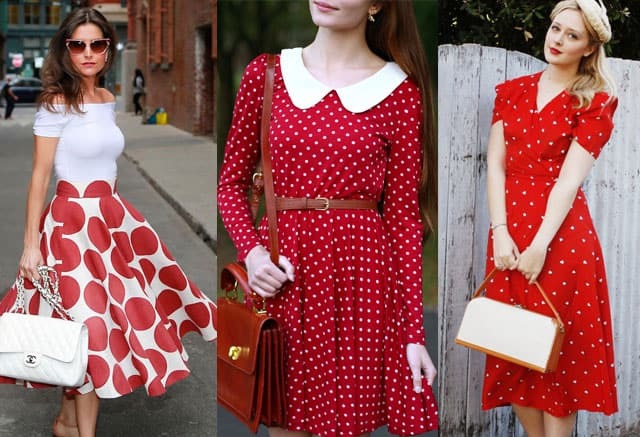 Red dress in white polka dots may appear somewhat aggressive and can hide individual characteristics of women. It is not suitable for office work, but ideal for the crowded festive party. Such a dress should not wear bright jewelry and large, they only increase the feeling of aggression, it is better to choose a thin gold chain or bracelet, or a string of medium-sized pearls. To suit along similar white jacket and white shoes. A more stringent dress made of thick black jacket silk or satin, black patent-leather shoes and bag. The length of skirts or dresses, according to the advice of experts should reach the knee or slightly above. It is believed that red polka dots on a white background is particularly suited blondes and brunettes but may choose a coloring, especially if it is a major figure in the saturated background. A white dress with red polka dots looks less challenging. This combination gives a refreshing and active way of his mistress. Slim blonde model is recommended skirts and dresses to the floor — they visually lengthen the figure, provided that the polka dots will not be too large. Girls with dark skin and dark hair, experts advise to dress like a knee-length color. And if a woman curvy shape, the dots should be small and frequent. These dresses are well combined with white vests and jackets, knitted cardigan light neutral colors twist and accessories. 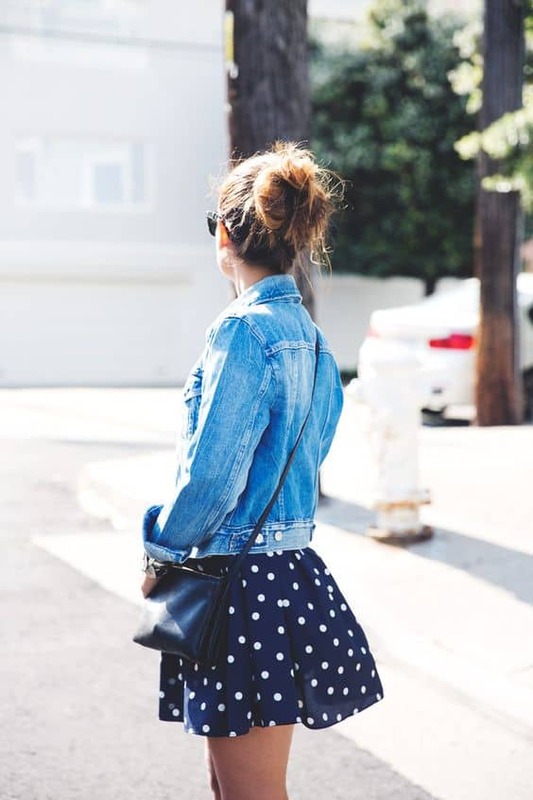 White polka dots on a blue background is perfect for creating a set in a nautical theme, appropriate for walks, going to the movies, and the rest goes well with thin scarves blue, white and beige berets and hats, knit cardigans, beams. Very presentable dress will look brown or beige tones with white polka dots is medium in size. It is worth remembering Julia Roberts’ character in the popular film, dressed in a dress. This outfit can be supplemented with a white belt, wide-brimmed hat and shoes on average heel. You can also add a solid color silk scarf brown or beige jacket and classic pumps. 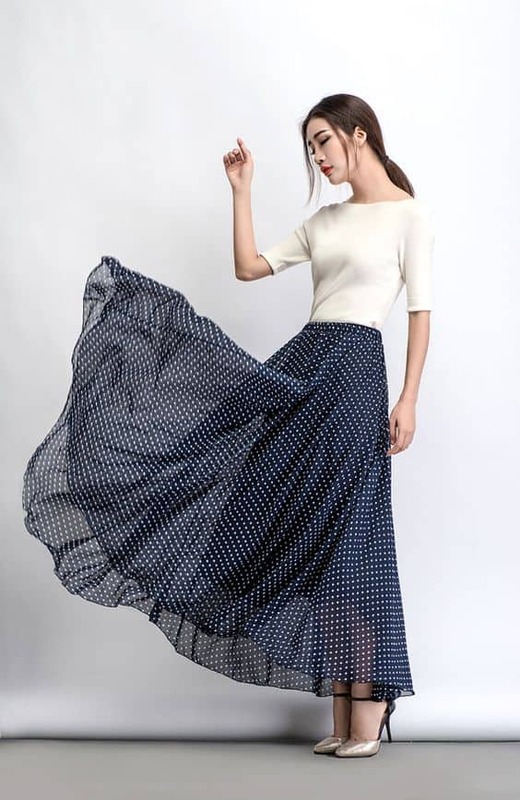 Polka dot maxi skirt with ivory top and red lipstick – it is a piece of romance that fit perfectly in casual image.